Current CPP cost is not low at 1.32% of assets (2010 fixed administrative costs=0.61% and investment related costs=0.71%) on an absolute basis, however on a relative basis it is much lower than what typical retail RRSP/RRIF mutual fund investor will pay. However, building expanded-CPP and/or PRPP (incrementally voluntary or mandatory) on top of the existing CPP administrative infrastructure would reduce incremental administrative costs to close 0%. Furthermore, using a passive portfolio implementation (either a fixed asset allocation or a target-date type glide-path) the investment management cost could be kept well below 0.3%. Independent of the level of the incremental contributions, this level of costs (<0.3%) over a 40 year accumulation period would result in 25-30% higher level of retirement income than if savings were invested at a cost of 1.32% cost, and 75-100% higher than a retail mutual fund based RRSP/RRIF implementation (2.5-3.0%). Adding a compulsory (pure) longevity insurance option, and requiring that about 8-10% of the accumulated incremental funds be allocated to this at age 65, would insure a lifetime income stream starting at age 85 and still have over 90% of the incrementally accumulated assets be available for covering age 65-85 expenses, emergencies or an estate.. Recently there have been a number of articles which questioned the commonly held belief among Canadians that that the CPP was low cost (and guaranteed). -given that there are about 16.6M CPP participants (12.6M contributors (p.24) and 4M current pensioners (p.26)) then the $820M 2010 administrative cost represents $49/participant. Therefore total or ‘all-in’ cost for the CPP in 2010 is 1.32% of assets, comprised of 0.71% of assets associated with investment related activities (operating, transaction, and external management fees) and administrative expenses of 0.61% or $49/participant. I assume that the $820M administrative costs are allocated to the entire asset base in a uniform manner, so even though these costs are incurred due to a very large number (16.5M) small ($8000 on the average), the ‘all-in’ cost must be considered to be 1.32%. The CPPIB switched to an active approach to managing its portfolio in 2006 as described starting on p.20 of the CPPIB’s 2010 Annual Report. The results are just another demonstration of how difficult it is to consistently outperform a passive investment benchmark, after costs/fees! So you might wonder why even try except perhaps at the margin. 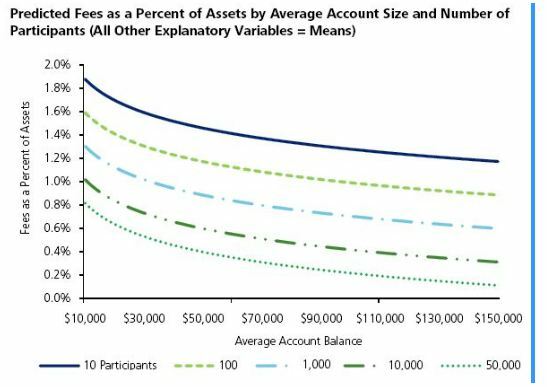 Consider the lowest cost point on this graph, the Average Account Balance= $150,000 on the 50,000 participants curve; it is about 0.1%. If we assume that the $40-50/person fixed cost is applicable here as well the fixed costs are about 0.03% and investment management fees are 0.07% (consistent with available institutional low-cost index funds). Therefore the investment related costs (excluding administrative costs) is about an order of magnitude lower than the 0.71% CPP costs. Trying to make sense of the CPP vs. the Deloitte numbers, then if administrative cost per member in the Deloitte report for the 50,000 members curve at the $10,000 account size is the same as the $49 CPP cost, that would leave about 0.3% for investment management. This 0.3% for investment management expenses is easily achievable when you consider the fees charged by Vanguard to retail investors about 0.18% for target-date funds and 0.5% for managed (monthly) payout funds, and 0.07% or even lower for institutional index funds. Another benchmark is that I manage my passive portfolio as a retail investor for about 0.3% of assets. At an institutional level 0.3% for investment management fees should be a ceiling. So putting it all together, it would be difficult to argue that CPP at 1.32% of assets is cheap, even though it is much cheaper than costs borne by individual RRSP investors using mutual funds. Furthermore, using a passive portfolio implementation (either a fixed asset allocation or a target-date type glide-path), the investment management cost could be kept well below 0.3%.